Yeah, but: This isn't just strange, it's strange-even-for-me. The Long Version: I blame Roman Mars. His radio/podcast 99% Invisible profiled the streaming web audio from "You Are Listening To…", which combines live radio chatter from the police departments of various cities (New York, Chicago, Los Angeles) with a stream of ambient music. It's a surprisingly effective mix, but as much as I like ambient music – and who doesn't? – I wanted something more lively and more local. 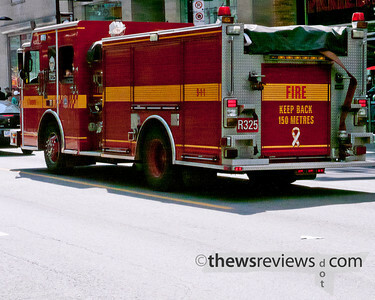 That's why I found Radio Reference and its scanner audio for the Toronto Fire Services. I was very quickly hooked on the feed, and will often have it playing even when I have other music on. To help the radio chatter make sense I've been learning a little more about the TFS and how it designates its trucks; I now some idea of the difference between a Rescue and Pumper (most Pumpers carry foam as well as water, while a rescue will carry more tools) and a Tower and Aerial truck (towers are rare but have an articulated platform and more reach). I'm still not quite sure what makes the Highrise unit of the South Command remarkable – I imagine that they're crewed by the best stair-climbers, but I'd love to know how their equipment is different. A fascinating picture emerges from combining the live audio feed with the list of active incidents. As an outsider and civilian, I have little to no idea what's involved in being a firefighter, and have only been able to watch them work a few times. 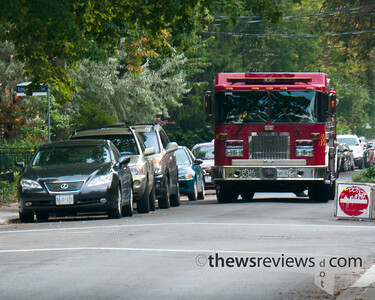 But now when I hear the sirens going past I can check out what's happening; recent calls in my neighbourhood have been for someone who lost consciousness at a restaurant, a chemical spill, and a garage fire. These are significant events with lasting impacts for the people involved, while for the fire crews and dispatchers these are part of the routine that's handled capably and without undue excitement. The mix of minor cataclysm and mundane administration is a little confounding. Naturally, the feed for the Fire department isn't a cornucopia of good news, and there's one call in particular that I wish I hadn't heard. But I've certainly gained a new appreciation for the Toronto Fire Service – and not because of their headline performance at the rare major fire, but because of all of the little things that affect peoples' lives without ever making the news. Stuck elevators, medical calls, power lines down, alarm checks: it's the unglamorous but important day-to-day work that impresses me. And it's a good thing, too – with the stunning performance of the Blue Wall at and after Toronto's G20 conference, it's time for a new hero. I can only hope that Mayor Dob Ford's "Gravy Train" sloganeering achieves its inevitable collapse before he does something foolish.